“Il dolce suono” from Donizetti’s Lucia di Lammermoor, sung by the masterful Joan Sutherland in one of her signature roles. The piece was composed in F major, but it is often performed in E-flat major – a step lower, which makes it more manageable for many singers. Did you notice the prominence of the flute? It is common for the principal flutist to take a bow following this scene. It has been said that the flute represents Lucia’s growing madness, a symbol of her mind taking flight from reality as she imagines a life with her love, Edgardo, after murdering her bridegroom, Arturo. The quintessential mad scene. “D’Oreste, d’Ajace” from Mozart’s Idomeneo. Just look at Hildegard Behrens’ face as she begins this famous aria. Wow! This is an early example of a mad scene, well before its heyday in the early 19th century (Idomeneo was composed in 1780 – 1781, when Mozart was just 24 years old). This aria is sung by Elettra (Electra), who must watch her love, Idamantes, King Idomeneo’s son, rise to power with his new queen, the Trojan princess Ilia. I don’t think Elettra is too pleased. “Una macchia è qui tuttora!” from Verdi’s Macbeth. I believe it would be inappropriate to compile such a list and not include at least one recording of Maria Callas, one of the most fascinating divas in all of opera. 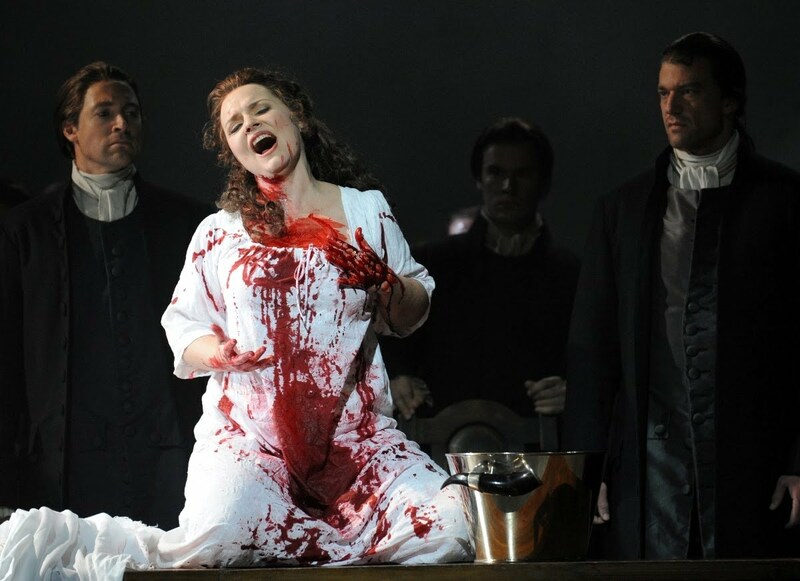 This aria is sung by a sleep-walking Lady Macbeth attempting to clean the blood off her hands. “Qui la voce sua soave” from Bellini’s I puritani, sung by Montserrat Cabbalé, another one of my favorite bel canto sopranos. Bellini, along with Donizetti and Rossini, was one of the leading exponents of the bel canto style. This is one of Elvira’s arias. She has descended into madness, yearning for her love, Arturo. “They Are Always With Me” from Corigliano‘s The Ghosts of Versailles. While most mad scenes come from the early 19th century, there are exceptions! This “grand opera buffa” (as its composer dubbed it) premiered at the Metropolitan Opera in 1991. Anyone familiar with the characters of Le Nozze di Figaro (The Marriage of Figaro) and Il Barbiere di Siviglia (The Barber of Seville) may be surprised to encounter Count Almaviva, Figaro, and Susanna in this modern opera. A fascinating work!